Species Description: Ahl E 1929 Zur Kenntnis der afrikanischen Baumfrosch-Gattung Leptopelis. Sitz Ges Naturf Freunde Berllin 1929: 185-222. 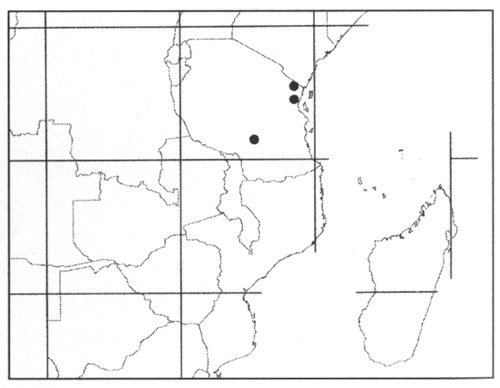 Revalidation by Gvozdik V, Tillack F, Menegon M, Loader SP 2013 The status of Leptopelis barbouri Ahl, 1929 and eleven other nomina of the current tree-frog genus Leptopelis (Arthroleptidae)described from East Africa, with a redescription of Leptopelis grandiceps Ahl, 1929. Zootaxa 3793: 165-187. Distribution of Leptopelis barbouri . Taken from Schiøtz (1999) Treefrogs of Africa, Edition Chimaira, Frankfurt am Main, with permission.